THANK YOU FOR YOUR PATRONAGE. WE ARE NOW CLOSED AS OUR LEASE HAS EXPIRED. IT WAS A PLEASURE SERVING EVERYONE WHO CAME IN. Click on "View larger map" & see our pics, reviews (& leave a review), share Jumbo Sushi with your friends, get directions, call & more! We're located at Times Square Mall on east side of No. 3 Road, across from Richmond Centre. Thank you for your patronage! WE ARE NOW CLOSED. THANK YOU FOR YOUR PATRONAGE. 1. Browse and Add to cart any dishes you like (see Our Signature Dishes). View cart when ready to order. 2. If necessary, Update your cart to any changes you'd like to make. 3. When ready, Proceed to checkout to place your order. 4. Fill in your billing details. * means required info. 5. Tell us YOUR TIME OF ARRIVAL in the Order Notes field. NOTE: please allow up to half an hour (one hour for party trays) for your order to be ready during our business hours (Mon to Sun 11-8pm). 6. Pay with your credit card or Paypal account on our SECURE checkout. With Paypal, our Paypal email is jaybot2000@hotmail.com. 7. Or choose the option to pay with cash when you pick up your online order. 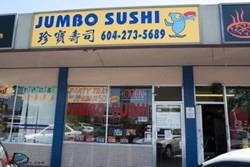 Your order will be ready when you arrive at Jumbo Sushi!